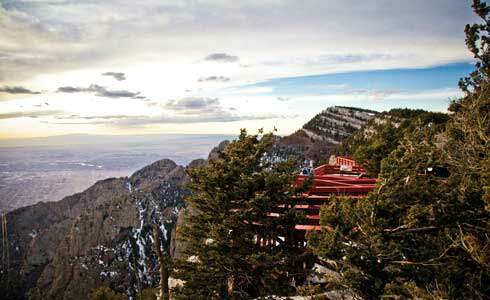 As the Sandia Peak Tramway soars into its 50th year—and welcomes its 11 millionth passenger this spring—it’s set to create even more golden moments for high-minded Burqueños. To mark its anniversary on May 7, the tram will receive two new cars designed by Switzerland-based CWA, which built the original cars as well as those currently in use. The look of the new cars is a closely held secret—all the more reason to attend the anniversary celebration and catch a memorable trip to the top. In 1966, business partners Robert Nordhaus and Ben Abruzzo, owners of the Sandia Peak Ski Company, dreamed up the tramway as a way to whisk skiers to the back side of the mountain. Even for the Swiss specialists at Bell Engineering, which had built more than 50 tramways in Europe, the Sandías’ steep, rocky terrain proved a challenge. Construction took two years as the builders laboriously constructed two towers—one of which could be reached only by helicopter—and suspended cable for the 2.7-mile ride from Albuquerque’s foothills to the 10,378-foot crest. The result is the longest tramway of its kind in the world, though passengers often overlook the engineering feat to focus on the awe-inspiring views. During its 15-minute journey, the tram glides over stunning granite cliffs and spires—at one point hovering a thousand feet above the floor of Big Canyon. Sharp-eyed riders may spy black bears, mule deer, or golden eagles during the ride. At the top, 11,000 square miles of Río Grande Valley vistas unfold below, from the Albuquerque cityscape to the shapes of Mount Taylor, Cabezon Peak, and the Jémez Mountains rising in the distance. Visitors may dine at High Finance Restaurant (slated to close and be rebuilt later this year) before striking out north or south along Crest Trail for miles of hiking through ponderosa forests. During ski season, the tram is a quick way to reach the slopes on the east face of the mountains; from late spring to early fall, mountain bikers can ride the ski area’s 26 miles of trails.